This column is sorta like a buzz saw, it’ll just rip a bunch of stuff up. First, the coveted Kelly Burke endorsements. You may not realize it, but there are statewide and even some local elections coming up on May 22. Early voting concludes this coming week, so you can avoid the massive rush by voting early. Lots of people await my endorsement so they can make the best informed decision possible for these important jobs. Like Public Service Commissioner. Right? My endorsements this year are easy. I’m voting for the candidate who I think will do the best job promoting liberty for the people. In every single race, I’m going with liberty. Can’t lose. So pick the person that you think best promotes liberty and vote for them. See, that was easy. Speaking of elected folks, my world came crashing down this week when I found out that Houston County Chairman Tommy Stalnaker doesn’t regularly read my column. Shocker! He knew nothing about the Great Stalnaker Baja Race over Houston County’s bumpiest roads. When I told him that Lake Joy was my candidate for worst road, he quickly pointed out that the potholed excuse for a road was in the city limits of Warner Robins. He’s always passing the buck, that Tommy is a slick one. Wonder if he’ll read this? Speaking of not reading my great words of wisdom, President Trump doesn’t read my stuff either, but I read his. I made a vow this year to spend a lot less time on national “news” and more time with my last school child at home, Alden. It’s going well, but I can’t help but check the headlines each day to see who Trump has ticked off. I don’t usually read the story, headlines are all I need. He’s good for at least one insult a day. Speaking of Alden, we took her MGB to Providence Canyon State Park a few weeks ago. She lost her fan belt on Russell Parkway, but Ronnie Babbitt and Russ Pierce insisted they could fix it, so sure enough, they popped it back on. She then made it almost to Fort Valley before the same defective belt came off again. This time my wife, towing a trailer for the first time in her life as an emergency measure (we had a bunch of old English cars, after all), towed it the rest of the way to the park, some 75 miles later. There Ronnie and Russ put on a new belt while I relaxed under a shade tree oblivious to their hard work. 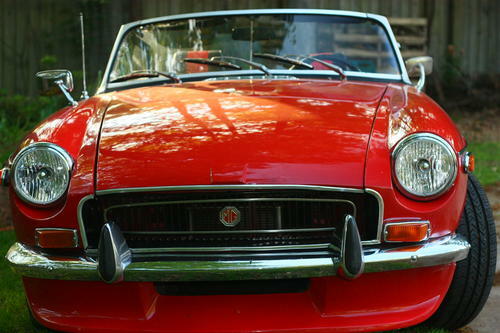 The MGB made it all the way back home. Next up? Working brake lights. I led the pack down there in my MGB, and was chided for going too fast. I don’t currently have a working speedometer, so it’s hard to tell my speed. No matter how fast you’re going, in a top down convertible it all seems fast. But we all made it eventually, except Ronnie’s gorgeous Triumph TR3. Seems Ronnie was talking bad about MGs and karma got him, quick. I like it when karma happens pronto. My wife then towed Ronnie’s TR3 all the way back home. She was exhausted. My friend Gary Rothwell, the retired GBI SAC from Perry, has a cool momentous occasion occuring. His dad, Dr. Donald F. Rothwell, is receiving the French Legion Medal of Honor for the Normandy campaign. The award is being presented in Gainesville, Florida, on Tuesday. I hope to make it there. And the final note for today, my wonderful, sometimes exasperating but always exciting daughter Elena Joie Burke is graduating from the University of Tennessee this weekend! I’m so proud of her. Along the four year trip, she’s handled more adversity than most people can manage, but she’s got a heart the size of a basketball, especially for my 91 year old mom and any four legged critter. Not sure what she’ll end up doing for a living, but a career coupling the elderly and dogs wouldn’t surprise me. Go Elena! You can go as far as the eye can see, enjoy the trip.